I'm excited to be going to Canada again, in January, less than a year after my Nova Scotia trip. I'm practically a Canadian already. I'm crashing at a Canadian theater friend's place for most of the time but for my first night I wanted to stay at the Hotel Nelligan. Why? Because Justin Trudeau was there. The image below is a screen cap from one of my favorite videos from my Justin Trudeau en francais collection, which I curated on Youtube. 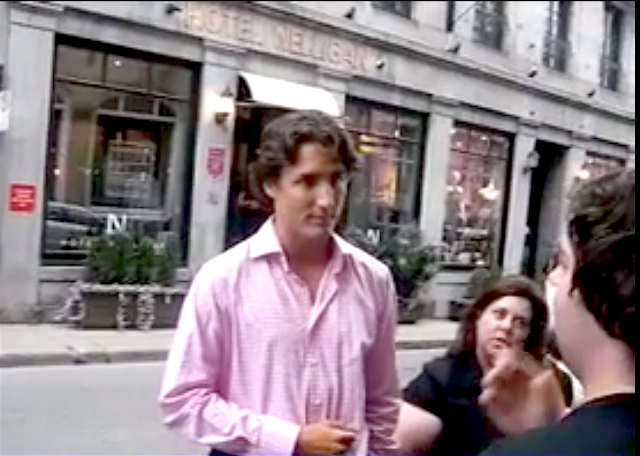 I love this particular video because it was shot by one of the Quebec separatists with whom Trudeau is arguing. Trudeau is in his politician mode but he is much less rehearsed, more spontaneous than the other videos I found. It's about as close as you're going to get to a home movie of Trudeau. At the end of the video you see him going into the Hotel Nelligan, which is behind him in the picture here. I can't understand more than about 40% of what is being said although in my defense the sound quality is not great.